Let’s face it…it’s not a fun day for everyone. Many consider it a contrived “Hallmark Holiday”, whether or not they have a special Valentine (or Valentines). And some aren’t feeling the love on Valentine’s Day, or feeling much of anything. Others still may be pretty down about it. 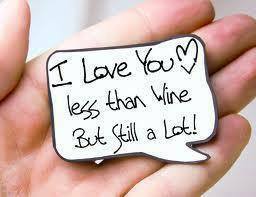 But if its a day you aren’t embracing, there is no reason not to drink good wine, whatever your reason for drinking. Maybe it won’t be festive like Champagne, but it can be wine that pairs well with your mood nonetheless and is still enjoyable. If you are feeling all warm and fuzzy about Valentines Day and want the lowdown on sparkling wines, then stop right here and watch my primer (https://www.youtube.com/watch?v=xT9-i5s2LFo). If not, please continue. 1. Grignolino. A grape native to Piemonte in Italy, the name in local Asti dialect translates to “many pits” and let’s face it, while some are acting like life is a bowl of cherries, or at least grapes, on Valentines Day, for some, its a bowl of pits, or maybe even seedy. The pits in this grape can make for a bitter and acidic wine, but it is also thin-skinned, making a wine that appears washed out. This is all sounding perfect for the theme, isn’t it? But we are looking for appropriate and good wines, and grignolino makes a nice refreshing and food friendly red wine (and rose too). It wont come it at a burdensomely high alcohol level so you won’t have to suffer on February 15 too. 2. “Nevermore” Pinot Noir from Gothic Wines. Gothic Wines…dark, right? For those not familiar with Poe and “The Raven”, but it tells of a talking raven’s mysterious visit to a distraught lover, tracing the man’s slow fall into madness. “Nevermore” is the phrase the raven utters to the young man in response to all his questions, but its also a well crafted, classic style Oregon pinot noir that will make you want to have some more. 3. “Dark and Brooding” Red Wine Blend from Palmeri Wines. A lot of people are dark and brooding on Valentines Day. A lot of wines claim to be dark and brooding, but this one has the actual name. A mystery red blend from this CA winery, most likely with a zinfandel and petite sirah blend, it isnt as inky and high charged as some similar blends, but with that name, if the shoe fits, wear it…and wear it well you will if you can find this limited production wine. 4. “The Black Wines of Cahors”. Quick…name the region most historically associated with Malbec? And by historically, I mean more than the last decade. That would be the Cahors region of France, where wine was first made by and for the Romans two thousand years ago. How historical? Wines were first made here for and by the Romans two thousand years ago. They were served at the wedding of Eleanor of Aquitaine and King Henry II, and Russian tsars were especially fond of it. Peter the Great said the deep tannins helped cure his stomach ailments. These malbecs are not your strip mall wine store mass produced $8.99 quaffable varieties from Argentina. They have traditionally been recognized as “black wines”…some of the darkest and strongest red wines available, but also rich and at their best, will age well for years (hey…that sounds like a great Valentines date!). Want something really complex and intense to go along with your “black” mood? Look for the ones labeled “Speciale”. You deserve it. 5. Mercer’s Ice Cream. In the past, I have said that sometimes the best thing to have if you are in an anti-Valentines frame of being is a pint (or so) of Ben & Jerry’s. That is until I discovered Mercer’s wine ice creams from New York State. 15% butterfat will help smooth out the ragged emotional edges and the 5% alcohol content will buff those smoothed out edges nicely. There are eight flavors of wine ice cream: cherry merlot, chocolate cabernet, peach white zinfandel, port, red raspberry chardonnay, resling, spice and strawberry sparkling. Yes, I’d even try the white zinfandel flavor, and many of you know how I feel about white zinfandel, but you don’t know how I feel about ice cream, especially peach. But really, life is too short to get crazy about one day out of the year. And don’t use wine to anesthetize and feel less. Use it enhance and feel more. Cheers!